How to view or update a donation in Method. Sometimes, you or your staff will need to go back and make changes to a donation you’ve already logged: to update accounting information for a particular donation, to send out emails or print receipts, to update notes and details about the donation, or just to review. 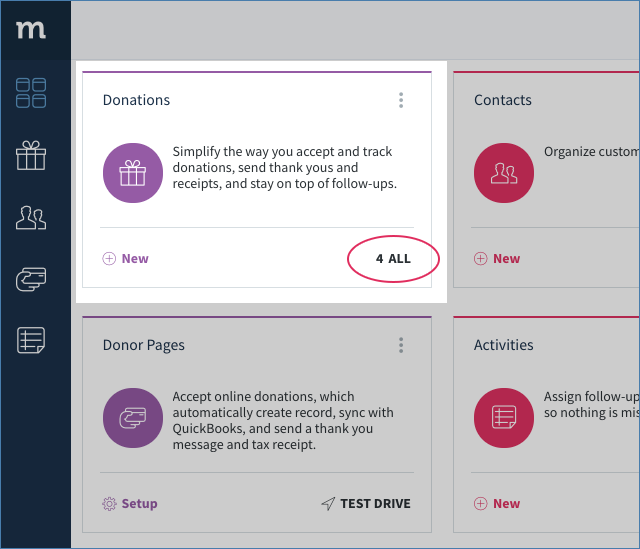 The following sections will show you how to view and update an existing donation record in Method's Donations App. 1. From your Method dashboard, click All on your Donations App. 2. This opens your Donations List. Locate the donation you wish to edit and click on it. You can search manually or use the search function at the top of the screen. 3. This opens the View/Edit Donation screen. As you can see, there is a variety of information available to you on this screen. The following sections will discuss the options in detail. In this section, you are able to update general information about your donor and their donation. The app ribbons at the top of the screen displays all activities associated with this donation. Clicking New directs you to the New Activity screen in the Activities App, where you can create a new activity associated with this donor. You can edit the billing or shipping address by clicking Edit. Note: Changes to the address only affect this donation record. They do not update the donor's profile. 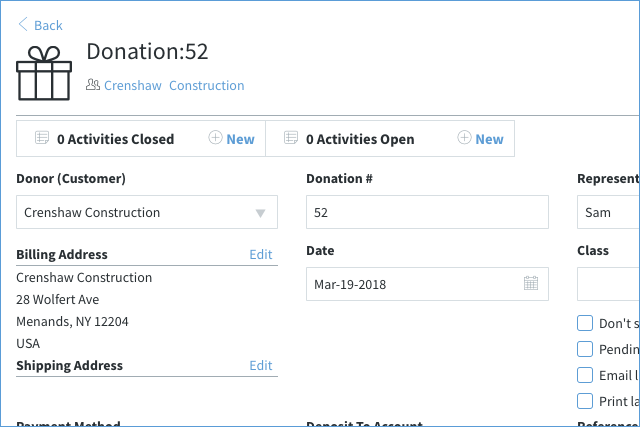 Donation # - assigned by QuickBooks when the donation is synced (donation numbers are assigned sequentially) but if you want to manually change it, you can do so here. Note: You have the option of allowing Method to assign this number instead. For QuickBooks Online instructions, click here. For QuickBooks Desktop instructions, click here. Date - when the donation was entered. Representative - The sales representative associated with your donor in the Contacts App. 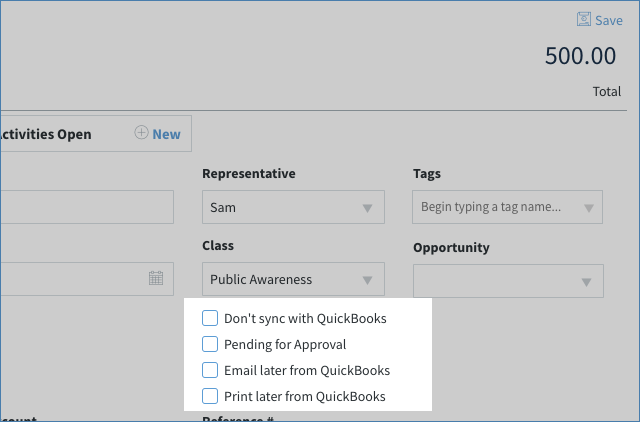 This is a QuickBooks Desktop-only feature. Representative: User or Sales Rep you have assigned this donation to. Class: This is the program the donation is for. 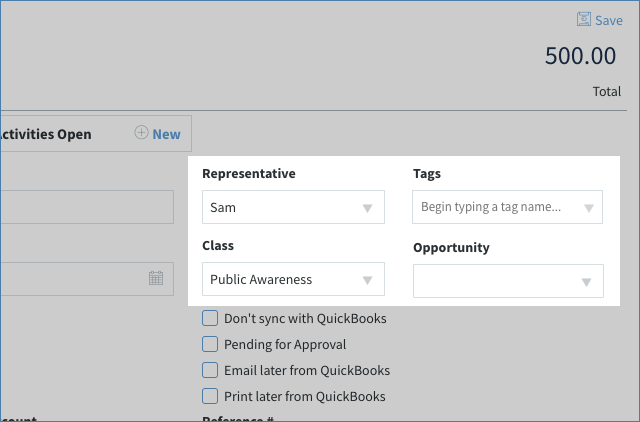 It is only visible if class tracking is enabled in QuickBooks. Opportunity: If you have the Opportunities App, you can associate this donation with the opportunity. 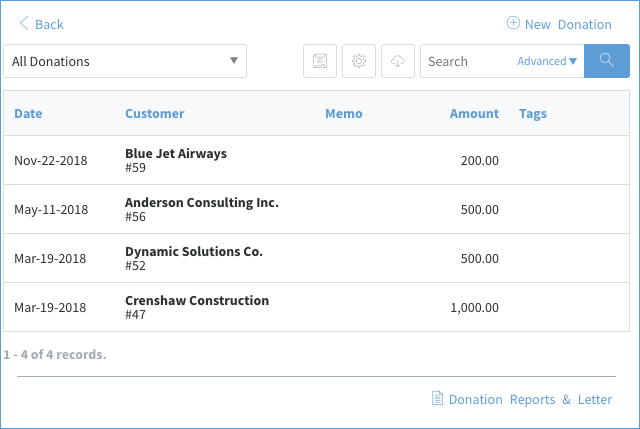 Don't sync with QuickBooks: When checked, this donation will NOT sync to QuickBooks. When unchecked, this donation will be saved to QuickBooks as a Sales Receipt. This section gives you several options pertaining to how this donation was received and how it should be synced. The Process with Payment Gateway checkbox will be unavailable if the donation has already been processed by a payment gateway. 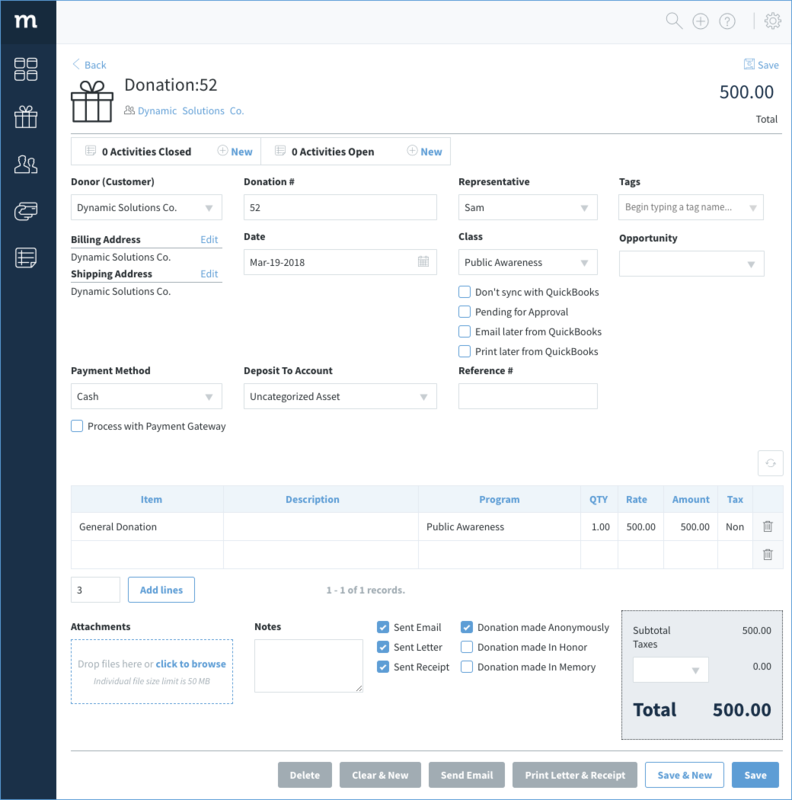 This section displays the donation items included in this donation in a grid. To add more donations line items, click directly in the grid. Select the trashcan to remove items. Donation line Items will not be saved until you save the whole donation. If you change line items and then leave the browser page, or navigate away, the line items are not saved. This information provides context about the donation as a whole. Attachments: You can attach files to this donation. Notes: This includes the original notes you recorded when you logged the donation. You can edit or add to them here. Sent Email: Automatically checked if you sent a thank you and receipt via email when you logged the donation (click here for details). Sent Letter: Automatically checked if you printed a thank you and receipt when you logged the donation (click here for details). Sent Receipt: Automatically checked if either of the above boxes are checked. Donation made Anonymously/in Honor/in Memory: Automatically checked depending how the donation was entered on your donor page (see Donor Pages). Delete: Delete the donation. Deleting a donation cannot be undone. Clear & New: clear the donation form to enter in a new donation. Print Letter & Receipt: please see Print a Receipt in our help center for more information on printing a receipt and thank you letter. Save & New: save the current donation and then clear it to enter in a new donation.